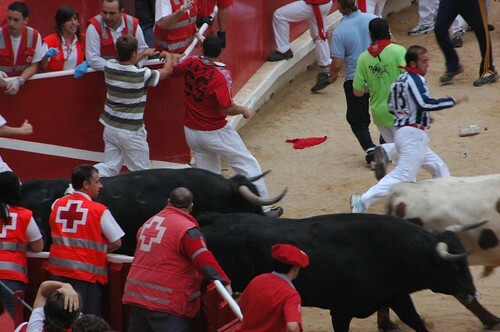 Because we were already in Spain while it was going on, I decided that we had to go see the Running of the Bulls. 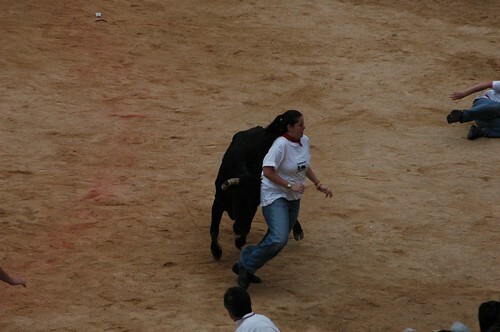 Long story short, Pamplona smelled like a washroom in a dodgy club and Tomoko and I really wanted a bull to injure someone. With the show over by 10am, people get ready to binge drink through another day. 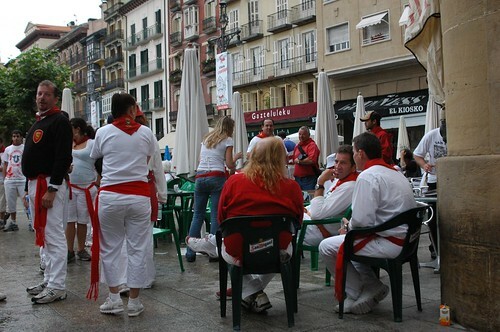 And with that we leave Pamplona behind and make our to Barcelona. While I’m sure that there are lots of neat things to do there, Madrid was pretty much just a stopover between Granada and Pamplona. This was made worse by having lost our guidebook. But there was one thing that we did want to do, visit the Prado museum (it’s name in Spanish is Museo del Prado – the Prado Museum, but it’s really an art gallery). So we put our things in a locker at the bus station and then made our way to the museum. 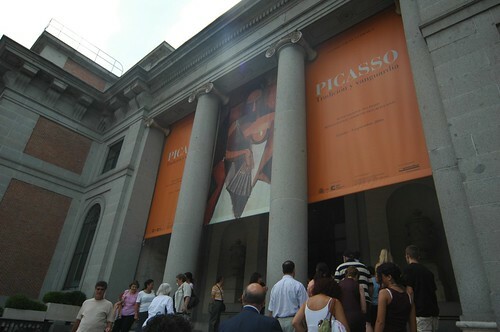 The Prado is a renowned gallery and houses lots of great works. Here’s a link with some of the more famous ones. Sadly, the first thing we did when we got there was use their washrooms (so much better than the one at the bus station), and then had some breakfast in the gallery cafe. But after that we got serious about art. Half-way through we realized that there was a simultaneous Picasso exhibition going on and that we really wanted to see it. The exhibition was to commemorate the 25th anniversary of the repatriation of Guernica and was actually split between the Prado and Reina Sofia museums. Sadly to see it, we had to re-enter the museum (but didn’t have to pay extra). So we took in the half at the Prado and then gave ourselves a lunch break. Whenever we eat out we spend far too long deciding on where to go. Basically we veto everything we see until we are far too hungry, tired and/or angry to look any more and then settle on the first thing we see. This was no exception. We happened upon a restaurant that was having a really cheap lunch special and decided to give it a go. The food was really good. We decided to get gazpacho for our appetizers (it was our first time having it) and were hooked. I miss gazpacho. The main was tasty and filling, and then came dessert. I ordered something called a Crema Catalan in the hope that it would be similar to crème brûlée. It was 🙂 and was sooo good. After that we made our way to the Reina Sofia museum, but on the way I gave a euro to a really shady dude with some made-up story of woe because he spoke English. Tomoko was pissed off at me about that for a long time after. Checked out the museum, saw the regular collections as well. 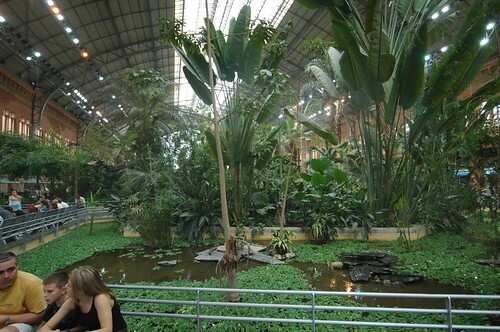 The Reina Sofia houses all the 20th century art while the Prado has the older works. Between the Reina Sofia and the Tate Modern, I’ve got to say that I like modern art more than the classical stuff. After a few more hours of art we both had enough and wanted to see a bit of Madrid, so we made our way to Puerta del Sol, because hey it’s the centre of both Madrid and Spain (in that all distances were measured from there) so why not? 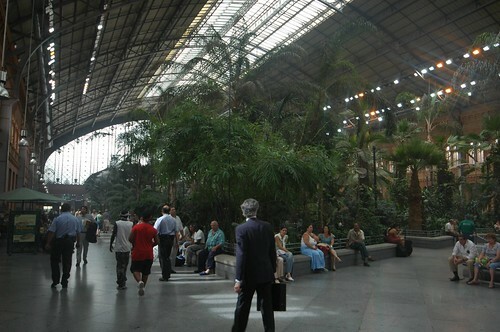 From the museum to the metro we walked through one of the coolest train station ever. Tomoko was less than impressed (although the humidity in there may have had something to do with it). Lots of people hanging out there, lots of shops too. We did some shopping. 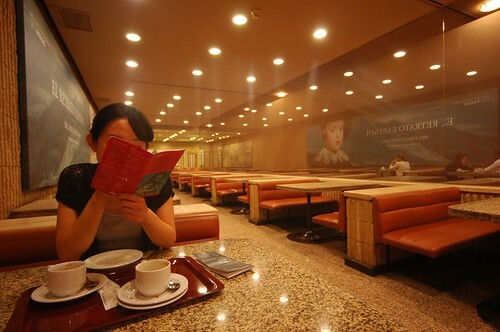 We also made use of the bookstores by looking through their guidebooks to get information on accommodation for the remaining legs of our trip. After the shops were all closed we went off in search of food. 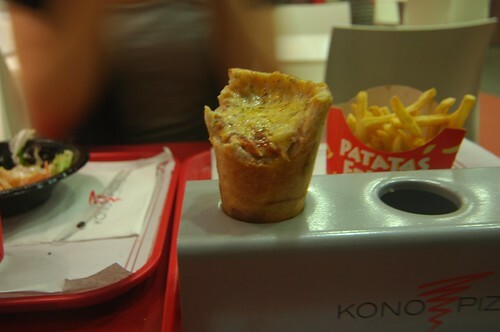 This took a very, very long time (I guess we weren’t exhausted enough yet), but eventually we found somewhere that was just too compelling to not go to – Kono Pizza. 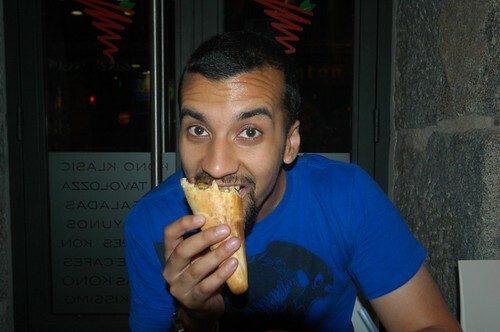 Pizza in a cone, what could go wrong? The guys working the counter were quite friendly and helpful in explaining our menu options to us. Tomoko thinks they were gay (I guess we’ll never know). After finally deciding on our order we sat down and waited for the pizzas to be made (they use a conveyor oven deal similar to the Quizno’s sub-toasting set-up). It was pretty good. After eating it I was still hungry, so I had a salad pizza (ie not cooked) with basil, cherry tomatoes and mozzarella which was even better. If and when they make it to Canada I recommend giving it a try. 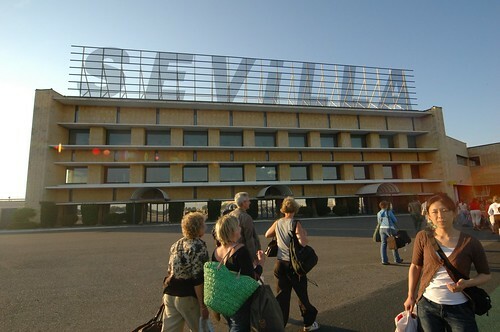 We made our way back to the bus station to get the overnight bus to Pamplona. By the time we got to Granada from Córdoba we were fairly bored of seeing the sights. We had our tickets for the Alhambra for the following afternoon but for our first day we went shoe shopping. From before we left Tomoko had been looking for shoes to wear on the trip. I kept telling her to get something comfortable like a sport sandal or some Birkenstocks. She kept looking for cute sandals that would give her foot no support and prematurely cripple her. By the time we had gotten to Granada her sandals and feet were in pretty bad shape so it was necessary to get something. Eventually she settled on a pair of Birkenstocks, but not without a fight. In the evening, after dinner. We had the best ice cream I have ever had. One scoop of Ferero Roche and one of coconut. It was amazing. 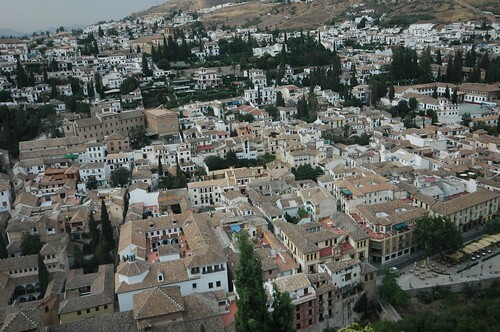 There were lots of Arabs in Granada, so it was pretty neat. The city had a feel that it was still inhabited by the Moops. 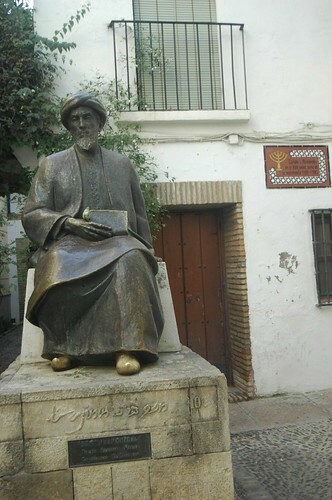 The following day we just wandered around the city, ending up near a monument to Lorca, but didn’t actually get to it. After lunch we started our trek to the Alhambra. 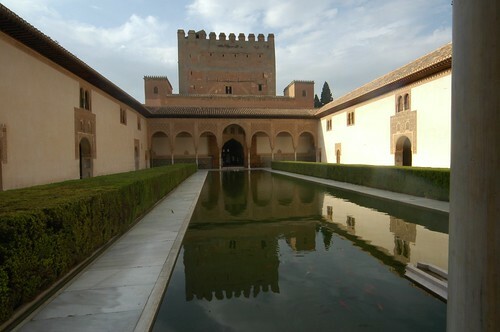 The thing to realize is that the Alhambra is a fort. So naturally it would want to occupy the high ground. This meant we had to walk up to the higher ground, which was just a bit long. To keep it from getting too crowded, only a certain number of tickets for the Alhambra are issued in a day. 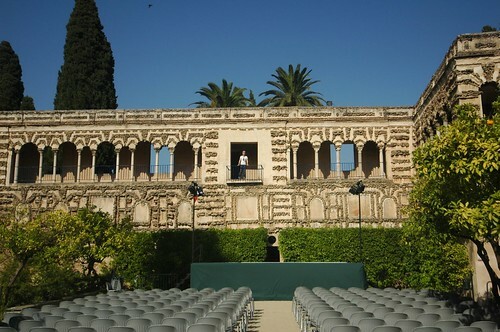 Furthermore, your ticket specifies a half-hour window to visit the Nasrid Palaces. You must enter the Palaces in that time, but are free to stay for as long as you want. When we got to the Alhambra there was only about half an hour before our allotted time so we were suggested to go straight to the palaces. But we had time to look around the on the way. Then we had to wait in line to get into the palaces. Because they let everyone in at the same time, the first few rooms were really crowded as we hadn’t all been separated by our differing paces yet. Generally we take more time than other people because I always take a lot of pictures. I took way too many here. But eventually they kicked us out because they were closing for the afternoon. 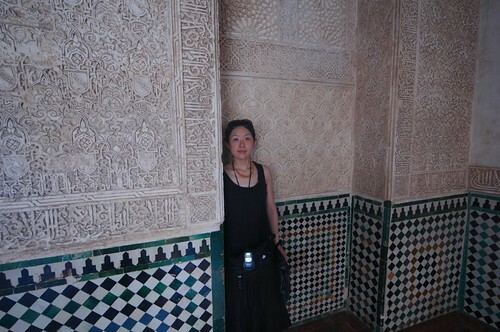 When we got back from the Alhambra I realized that I couldn’t find our guidebook. If it were just a Spain guidebook it would be OK, but it was a Europe guidebook, which meant that it had our itinerary for the rest of Spain, France and England. That evening we were heading out to Madrid so I had one last chance to have the ice cream. Sadly we couldn’t find the place so we had to leave without having it. Leaving Seville by bus, we made our way through Andalucía to Córdoba. The bus ride was really nice as we got to see lots of sunflower fields. Sadly, most of the sunflowers looked like they were dead or something. I’d say they’d been harvested, but I have no idea how they would harvest the seeds (I’m thinking it would be easier to cut the flowers down and then have the seeds removed mechanically in some machine, but the flowers were still there so I don’t really know what was going on). 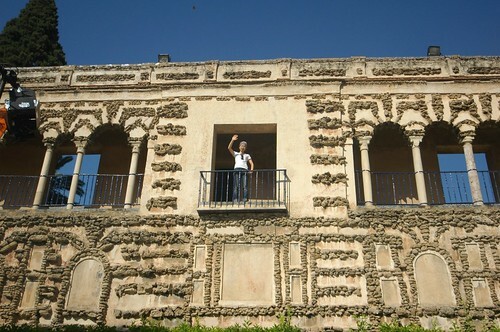 The bus ride wasn’t all that long, 2-3 hours maybe so we were in Córdoba by early afternoon. The first thing we had to do was find a place to stay. We settled on the local youth hostel because a) they had availability and b) they were cheap. 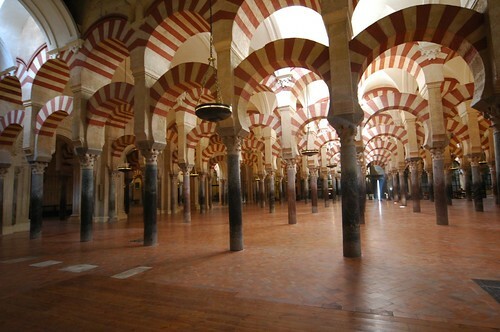 The main sight in the city is the Mezquita, a mosque containing a seemingly infinite number of arches in which a cathedral was inserted into the middle (which most people seem to think was a crime against aesthetics). We decided not to go there on the first day because we didn’t want to rush things. 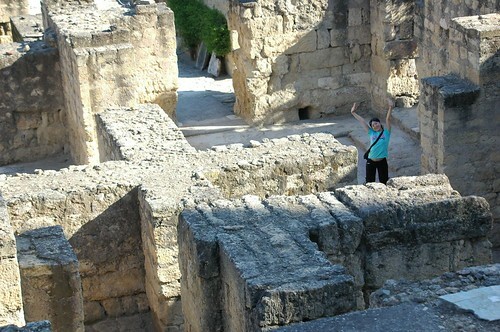 So instead we took a bus out to Medina Azahara, a Moopish palace that had become ancient ruins. One nice thing was that the place was pretty empty. Maybe 15 tourists in the entire palace. That evening we ate some Paella and watched the World Cup 3rd place game between Germany and Portugal. The restaurant where we ate the Paella had a sign saying they were showing the game, but there were “technical difficulties” and the game didn’t show. The paella wasn’t all that great either. While we were eating it, we got into a conversation with a Canadian girl who was traveling by herself. She told us about how she was robbed in Barcelona, and that we should be careful when we go there. After finishing the paella we went in search of any place that had the game on TV and eventually found ourselves watching the second half in a tiny bar that had its own Germans. There was also a big guitar festival going on in the city, lots of famous guitarists, but we didn’t feel like going to it. 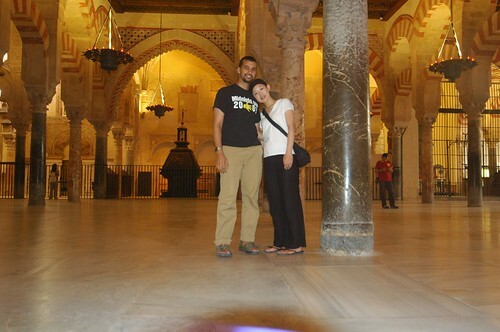 The next day our plan was to tackle the Mezquita. 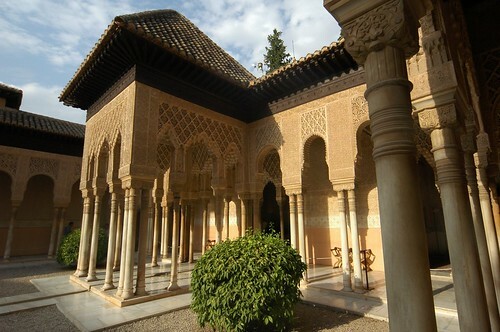 But before going there we decided to check out the Alcázar de los Reyes Cristianos (In Andalucía it seemed like every city we went to had a Mezquita and and Alcázar). 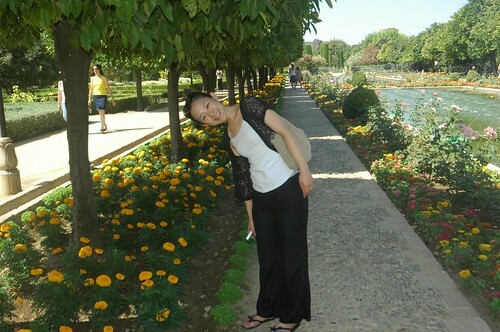 It was nothing special, although the gardens were pretty nice. But it was really, really hot: 45° so we didn’t spend that much time in the gardens. For lunch that day we decided on Burger King because they had Superman toys in their kid’s menus and I wanted a Superman toy. I ended up getting a blue wrist-band. 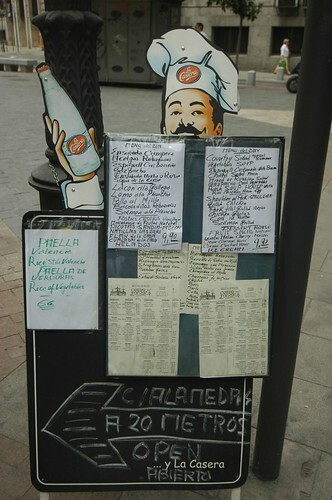 One thing about Córdoba was the amount of beggars. There were tons of them. Women carrying their babies around, asking for change. After lunch we made our way to the Mezquita, and spent a few hours inside. It was nice and cool in the building, very peaceful as well. I actually didn’t mind the cathedral in the middle. It had a really impressive pipe organ inside. Besides, it was kind of like getting two attractions for the price of one. Leaving the cathedral part, we just sat for a while under the arches. It was a good rest in a very peaceful place. That night we saw the World Cup final match between France and Italy at our hostel. There were a whole bunch of French kids (maybe last year of high school/first year of university) on a field trip and they managed to get access to a TV with the game. It was fun to watch, although being amongst that many French people made me want France to lose (Were I anywhere else I’d be rooting against the Italians). It was fun seeing their expressions when France lost on penalty kicks. 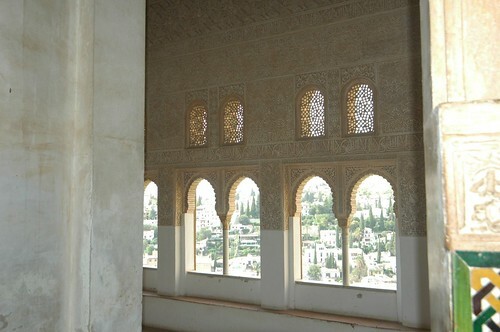 The next day we bought our tickets for the Alhambra (you are strongly recommended to buy your tickets at least a day in advance), had some ice cream (the ice cream in Spain was great), and made our way to Granada. From London to Seville we again flew RyanAir. If all you want to do is get from A to B then airlines like RyanAir are great. I wish we had airlines like that in Canada, although the distances involved would probably mean that the flights wouldn’t be as cheap as they are in Europe. What was really great though was leaving a city where the weather was cool and gray and arriving in when where even at night it was approaching 30°. It was also nice to look down on the fields of sunflowers from above. Sadly this time there was no good luck at passport control as pretty much everyone had to go in the non-EU passport line. But besides the line there were no issues. Traveling with Tomoko makes airports much easier. Taking a bus into town, we then walked around for a while until we found a hotel to stay at. 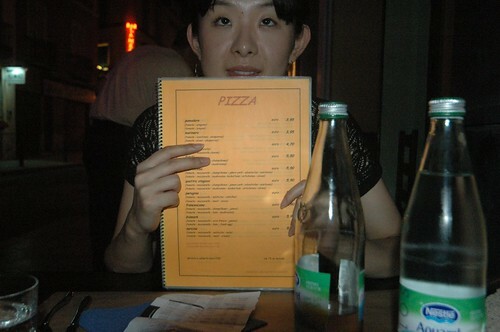 Then we walked around some more before going for dinner and eating that staple of Spanish cuisine – the pizza. There was one coffee shop that had some amazing looking ice cream, but we didn’t get any because we were pretty full. 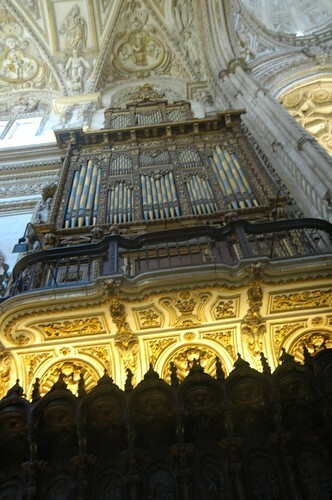 The next day we started off at Seville’s Catedral, one of the biggest cathedrals in the world (top 3 for sure). 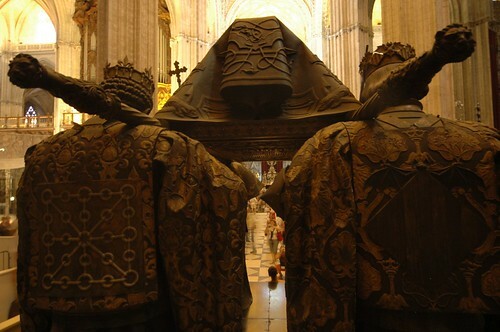 Inside was the grave of Christopher Columbus. I’m pretty sure that he’s in the box being held up by these statues. It was pretty cool to see (and I didn’t have to worry about stepping on any graves, a worry I have whenever I visit a cemetery). 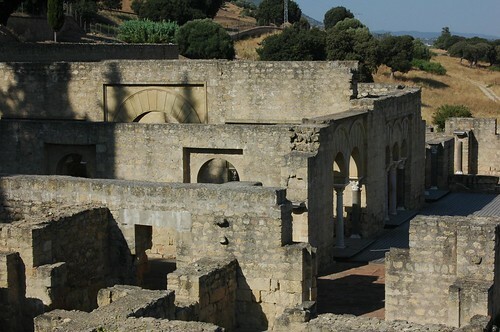 The cathedral is partially made up of the mosque that was previously there. 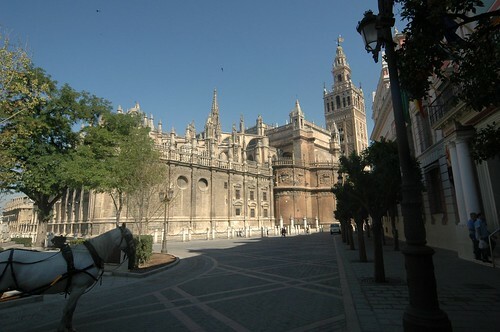 One part that remains is the minaret, which was converted into a bell tower (they now call it the Giralda). 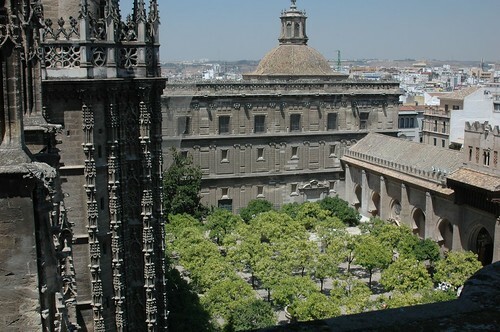 We climbed to the top of the Giralda and could see pretty much the entire city. 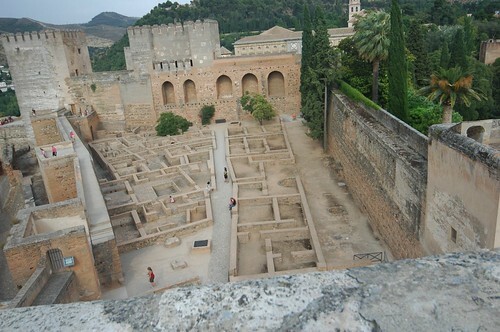 We could also look down at the courtyard of the cathedral which was another holdover from the mosque. I guess due to the high ambient temperature and an apparent lack of chlorination, the water in the fountains was very, very green. But this didn’t stop tourists from washing themselves in it (a common sight throughout the trip which we both found pretty disgusting). After this we went to the Alcázar, a palace built by the Moops. It seemed like this area was set up for a viewing of some important person like the Pope or Evita. So I waited among the seats hoping someone would come. And to my luck someone did. 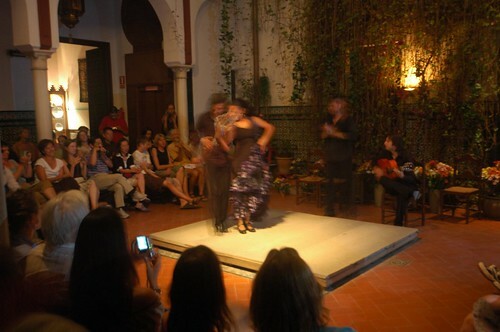 In the evening we went to see a flamenco dance. It was good. Tomoko absolutely loved it, she was totally raving about it afterwards. I think that may have been the highlight of the trip for her. 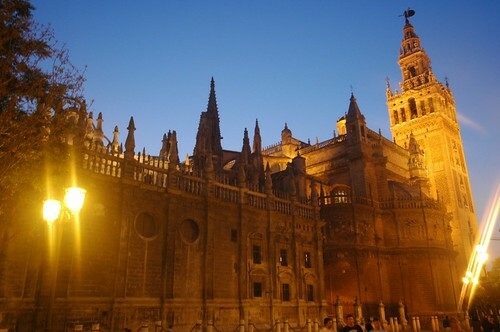 Like most hot places, Seville is really nice in the evening. So we walked around a bit more, returning to the Catedral area.